Hello my lovelies, I reached out to you guys on my Instagram (@livewithkatieblog) and asked if you’d like to see an eye makeup look using the Morphe 35N palette and you highly requested it. So here it is. As you may know if you’ve used Morphe palettes before the shades don’t have names which is quite annoying, however doesn’t shift the fact the palette is amazing. I personally love Morphe palettes because they’re not really on the expensive side and you get a hell of a lot shades for what you pay for. So today I will be running you through the look I created using the Morphe 35N palette which you can purchase from Beauty Bay for just £23. Now I think that’s an absolute bargain if you ask me, especially for 35 shades. All the shades in this palette are matte there are no shimmers at all so you may have to use your own shimmers if you want to up your look however this palette is made up of neutrals so it’s amazing for an everyday look. So to start off my look I used the first shade in the palette to just set my concealer (which I used to prime my lid) which is just a really natural white base shade which is perfect to just put down all over the lid. Next I moved onto transition shades, I used a burnt orange shade mixed with a brown to create a transition, popping both shades straight into the crease. The shades in this palette are super blend-able, I had no problem with blending the two together, plus they look so beautiful together. I wasn’t really sure what look I was going for when creating this but the beautiful dark purple/burgundy shades immediately popped out to me. I used the next two shades to darken up the crease, the lighter colour more so just to add a bit more warmth to the crease. Taking that same dark purple I then popped that onto the outer v of my eyelid and dragging it into the crease slightly, just making sure everything is perfectly blended together. I then added a gold shimmer to the top of the lid from another palette as like I said before this palette contains no shimmer what so ever. Underneath the last line I used some of the transition shades I used on the top lid just to pull the look together. Now that’s my eye look complete. It’s nothing too extreme or anything, it’s just a pretty simple look, one that I completely made up on the spot anyway. At the end of it you should pretty much have a finished eye makeup look somewhat looking like this…. I hope you guys like the look as much as I do! If there’s any other makeup looks or reviews you’d like me to do make sure you leave a comment down below! If you’re not already following me on Instagram make sure you give me a follow @livewithkatieblog I’ll be opening my giveaway up soon, it’s full of beauty products! Make sure you’re following and you’ll be the first too see when it’s opened! Maybelline Superstay 24hr Foundation… Worth It? Hello my Lovelies and welcome back to my blog! I hope you’ve all been having a lovely week because I know I have! Is it just me or am I the only person that is soooo glad the snow has finally gone? There’s no more fighting over bread and milk, everyome can go back to work, I can order take-aways, yay! Sorry it’s been a little while since I last posted but I’ve been making major changes to my blog and Instagram. It’s been absolute madness. Let me know what you think of my blog now that I’ve shaped everything up. I thought I would share with you today my thoughts on the Maybelline Superstay 24hr Foundation. I only buy drugstore foundation because being a student and all that we have a budget we need to stick to. I purchased this foundation from Superdrug for £9.99 which I thought was a pretty good price point for a foundation. It’s affordable even for those who are on a budget. Onto what the foundation is supposed to do. “SuperStay 24h full coverage foundation completely corrects visible flaws and imperfections making it the perfect base for a hi-impact make-up look. Relentless, all day wear. Lightweight hi-pigment coverage. Flawless transformation. End result: Transform your skin. DISCLAIMER: At the moment my skin is extremely dry so this foundation review will be based on my opinion on how the foundation works for people with dry skin. Right off the bat I love the packaging. It’s plain, simple and classy. Doesn’t look cheap, doesn’t look expensive so you’re getting exactly what you’re paying for; which in my opinion is great. I applied this foundation with a damp sponge and it applied so effortlessly and blended amazing. Like no joke, I was a bit shook because I wasn’t expecting it to be that good. The coverage was on another level. When it says the coverage is full, it really is. For £9.99 can you go wrong? It’s easily build able and does an amazing job of blurring pores and concealing blemishes. This foundation is super full coverage but doesn’t feel heavy on your skin at all. Even better it doesn’t look like you’ve just dipped your face in paint like some drugstore foundations do. As for how the foundation reacted with my dry skin, it was great. I mean I did plaster on loads of moisturiser before hand but it didn’t cling to dry patches at all which I was really surprised by. As for matching up to the description it does definitely do what it’s supposed to do! I would highly recommend this foundation for anyone who’s on a budget and want’s good value for their money. Since testing out this foundation for a few weeks ago it has actually replaced my old foundation and become my daily go-to. It is really worth it. For me, this get’s a 4.5/5, buy buy buy! Author livewithkatiePosted on March 7, 2018 Categories makeup, UncategorizedTags beauty, foundation, lifestyle, makeup, maybelline, review9 Comments on Maybelline Superstay 24hr Foundation… Worth It? Hello my Lovelies! how are you all? I hope you’re all having a lovely week. I’ve started to become more organised with planning blog posts and actually writing them on time lately. Fingers crossed it stays that way! I thought I would do something different today. 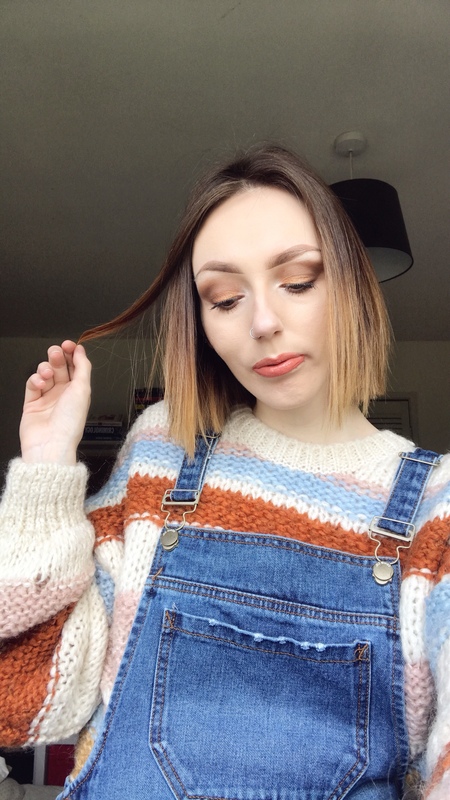 A little get ready with me make up post which I guess is pretty self explanatory, but if you don’t eat it, basically I will be taking you step by step through my make-up look that I created today using the Soph X Revolution eyeshadow palette. I must admit thi is one of my favourite eyeshadow palettes at the moment. I’ve been reaching for it quite a lot! I always start my makeup off by doing my eyebrows first. For my eyebrows I use Ka Brow by Benefit in the shade 3 just to outline my brows and fill them in. My eyebrows are really sparse and thin so this product really helps even them out but still look natural at the same time. After I’ve finished filling in my brows I use my NYX Full Coverage Concealer to tidy up my brows and make them look sharper. Along side this I then use the L’oreal Brow Plumper in the shade medium/dark to stick my brows in place so no hairs are poking out of anything. So, the brows are done. Next I move onto eyeshadow, I will again use the NYX Concealer to even out the skin tone on my eyelid (mine are pretty vainy) and create a nice base to start playing around with eye shadows. Now here where it gets a little bit tricky as I use loads of shades from the Soph X Revolution Eyeshadow Palette. First I like to create a transition shade to I blend Cuppa Tea and Pug into the crease. Blending them out nicely so there no harsh lines and the two shades are mixed together perfectly. Next I add the shade Rosewood into the crease and slightly onto the outer v of my eye. This is a beautiful brown shade which really darkens up the look. Next I cut the crease with my NYX Concealer and set the concealer down by blending the shade Penguin on top of the concealer. After all of that is set down and blended together I placed the shade Mug Cake on the outer corner of my lid and blend slightly into the crease. Next I used my finger to apply Grow Old onto the lid. I always find using my finger to apply shimmery/metallic shades they always have a better pigment pay off. Finally to finish off this eyeshadow look, I run the shades Cuppa Tea and Rosewood on my lower lash line to bring the look together. Now onto foundation. I used the Maybelline Superstay 24hour Foundation in the shade 03 True Ivory and blended this onto my face using a Technique Beauty Blender which leaves the foundation looking flawless on my skin. After applying foundation I use the Collection Long Lasting Concealer in the shade 01 Light under my eyes to hide my horrid dark circles and brighten up my eyes. Now onto my favourite part, highlighting and contouring. I used the Kiko Smart Contouring Palette in the shade 01 Light to add some definition to my cheeks and bronze up my forehead. Once blended in I moved onto highlighter. Today I used the Sleek Highlighting Palette Solstice and used the shades Subsolar and Hemisphere. These two shades are the most blinding from the palette which I thought would really compliment my make-up look. To finish off I finally do my mascara. I’ve recently been loving Bad Gal BANG by Benefit. It’s actually amazing and the more I use it the more I fall in love with it. Who doesn’t put love an amazing mascara? To set my makeup down I use the Avon Setting Spray which is actually pretty good for a budget setting spray. I’m not too fussed on having an amazing one as long as it sets my makeup down I’m pretty easy going. Here’s my finished makeup look!! Let me know in the comments what you think of it! Hello my lovelies! I’m back again with anther blog post, I’m trying to get more organised and blog more regularly again. I know it hasn’t been long since I last did a skin care routine blog post but since when I have switched a lot of things up in my routine. I’m still on Roaccutane so my skin is still extremely dry and fragile however, it’s not as dry and flaky as it used to be a few months ago. The majority of my acne has now cleared and I’ve just got a few blemishes left that I’m waiting for to clear. Anyway, onto my new skin care routine. My first step in my skin care routine is the Liz Earle Hot Cloth Cleanse & Polish which I use to remove makeup (in the evening) and any dirt on my face in general. This literally melts your make up away it is incredible, leaving your skin feeling so soft and smooth. It retails for around £16 which you can purchase from Boots, John Lewis or buy online from the Liz Earle website. After finishing up with the Liz Earle Cleanser I move onto a moisturiser. I use the Origins Make A Difference Plus Ultra-Rich Rejuvenating Cream which I got as part of an Origins gift set as a Christmas present from my parents. It leaves your skin feeling so smooth and hydrated it is unbelievable, I’ve never tried a better face cream before. This cream retails for £35 which I know is quite pricey for a face cream but it is 100% worth it. When I run out I will definitely be repurchasing. To finish up my skin routine I like to use the Origins Ginzing Refreshing Eye Cream to Brighten and Depuff which I also got as part of the Origins gift set. This well and truly actually works, my eyes have never looked so bright and hydrated before. It’s perfect for those days where I’m super tired and have dark circles under my eyes. It retails for £20.50 which again I know is pricey but it’s worth it. You can purchase Origins from John Lewis, House of Fraser and lots of other online stores. It has taken me months to find a skin care routine that actually works for my skin and I have to admit my skin is absolutely loving my routine at the moment. I have totally fallen in love with Origins products as they leave my skin glowing. It’s pricey but it’s a must for me, there products have to be in my skin care routine. Bad Gal BANG Benefit Mascara… Worth It? Hello my lovelies, how are you all? Sorry it’s been some time since my last post I’ve just been super busy with just life in general. I’m sure you’ve all heard that benefit has released a new mascara called Bad Gal BANG and everyone is absolutely hyped about it. So me being me I just had to try this out. I’ve never actually tried a benefit mascara before so I have absolutely nothing to compare it to other than my L’oreal Miss Baby Roll mascara that I’ve had for a while now. Anyway onto my first impressions. The price isn’t the most affordable but if you want to compare it to other high end mascaras I suppose it could be seen as one of the cheapest. This mascara retails for £21.50 which to me is super expensive for a mascara but if it’s worth the hype I’m definitely willing to spend the money. The packaging is absolutely stunning, I mean lets be real, it looks amazing. The packaging is kind of a black matte feel with the name of the mascara in pink printed on the side. The lid of the mascara (is that what you call it?) is covered in black rubber studs which make the product look really high end. It feels luxurious and has some weight to the packaging. Definitely looks and feels high end, you’re getting what you paid for. Now onto the mascara itself. I was hoping this mascara would live up to the hype, especially because of the price. My first impressions were that the mascara wasn’t any different to anything else I had tried before. UNTIL, I coated my eyelashes fully. And boy was I wrong thinking this was any old mascara. My eyelashes are typically thin and lifeless so I am always looking for a mascara that will give me volume and length. This mascara definitely delivered on both of those elements. The mascara is easily build able so you can apply a few coats without your lashes looking clumpy. The one thing I love about this mascara is that it brings drama to your eyes, you can wear is with a natural makeup look or you can totally glam it up and create lots of volume for a night out. There is no need to wear fake eyelashes as your lashes will look incredible. Take this from a girl who has short and lifeless eyelashes. My final thoughts on this mascara are that it’s an absolutely amazing product and definelty does what it claims to do although I’m yet to see if it lasts for 36 hours. However, I do realise this isn’t exactly a budget priced mascara which leaves me thinking it’s not an absolute nessectity and you don’t really need it in your makeup bag. If you do happen to have some money lying around or you want to spoil yourself then I’d definitely buy it, but it’s really not worth breaking the bank for. For me this mascara gets a 4.5/5, so I would recommend this mascara, 100%. Author livewithkatiePosted on February 20, 2018 February 20, 2018 Categories UncategorizedTags beauty, benefit, lifestyle, makeup, review7 Comments on Bad Gal BANG Benefit Mascara… Worth It? Hello my Lovelies, I’m back again with another blog post. This time slightly different from my usual beauty and lifestyle posts. However, I think that the topic of this post is super important and everyone should give self care a go. I hope you’ve all been doing well, I’ve come down with a massive cold so I’m led in bed all day binge watching Friends on Netflix. I have been practicing self care for around 2 months now and I can honestly say it’s the best thing I’ve done. Whether you’re in a good place or a bad place you will benefit from reading this. Practicing self care is something that I don’t think many people really know how to do. I definitely didn’t know how to do it until a few months ago. There are so many benefits from self care you wouldn’t even realise. Self care has proven to improve your immune system, mental health, help you be more productive as well as the obvious making you feel better. So you might be wondering how do you practice self care? Practice gratitude – write down 5 things that you’re appreciative for before you go to sleep. It could be thankful for having a roof over your head or grateful for something your friend did for you that day. It’s all about focusing your mind on the positives in life and not focusing all your time on the negatives. Meditate – this is a great one to start off with as its super easy. What could be more easy than sitting down and meditating? There are loads of apps out there that will guide you through mediation and make it a really enjoyable experience. My favourite app for meditation would be Calm which is available on the app store if you have an iPhone. Get Outside – sometimes there’s nothing more relaxing than getting outside and going for a walk. Clear your mind, take in the fresh air and take in the nature that surrounds you. Treat it as a mind detox, this is great even if you’re not in a bad mood at all. Exercise – a great way to relax your body is yoga. It’s light and builds up muscle in your body as well. It’s not overpowering like maybe running on a treadmill would be or deadlifting 80KG in the gym. It’s a great way to relax your mind and body. Let your feelings out – don’t be afraid to talk to someone about how you feel. It could be, your mum, a friend even a counsellor. Talking about how you feel to someone doesn’t make you weak. Don’t bottle up your feelings. Practice breathing exercises – there are many apps that you can get on your phone that give you breathing exercises. It can reduce your heart rate when you are stressed or upset and get you back into a more rational mind. This is great everyday to help yourself get into regular self-care. Stress less – one major thing that someone who is extremely close to me has taught me is that you have to live in the present. There’s no point worrying about how you’re going to feel in the future or what’s going to happen in the future because the truth is, no one knows. What’s the point in stressing yourself out about the unknown? Eat healthy – detox your body, you will feel benefits physically as well as mentally which is super important for everyone to have a happy and healthy life. Put yourself first – you can’t help anyone if you don’t help yourself first. Stop caring about trying to please everyone else, stop worrying about what other people think about you because at the end of the day you are the most important person in your life. I hope everyone reading this takes into consideration starting to practice self care because it is so so important and it has helped me so much through some rough patches I’ve been going through. Hello my Lovelies, sorry I’ve been totally MIA recently. I’m finally trying to get myself reorganised and back into blogging. I hope you’ve all had a lovely week so far, I’m so looking forward to the weekend. I thought I would write a blog today about my everyday make-up routine. My make-up routine rarely changes but it has recently due to it being Christmas and my birthday not long ago I’ve invested in some new make-up products that I would love to share with you. So for starters lets start with primer. I never usually stick to one primer, I’m always trying out new ones to find the perfect one for my skin type. For Christmas my brother bought me the Benefit Pore Fessional which you retails for around £27.50. You can purchase this from Boots and many other shops. The primer claims to minimize pores and I’m telling you now, it definitely does. It reduced my pores great and helped make my make-up stay put all day long. As for foundation I use The Ordinary Full Coverage Foundation for daily use. If you haven’t already read my first impressions blog post about this foundation then you can check it out here. This foundation is an absolute bargain, £6 for a foundation is just unbelievable and especially because the foundation is actually amazing. I purchased mine from ASOS but you can also purchase it from House of Fraser or Cult beauty for the same price. For my eyebrows I like to use the Freedom Eye Brow Pomade in the shade Soft Brown. This eyebrow pomade is soooooo good! And did I mention that it only costs £2.50?! You can purchase this from pretty much anywhere online at a relatively cheap price. If you want to purchase it you can get it from Superdrug here. For contour I use the Sleek Face Contour Kit in the shade Light. This retails for £6.99 in Superdrug as well, which you can purchase here. As you can probably tell already I live for drugstore make-up, I won’t buy expensive products unless I totally think they’re worth it. This also comes with a beautiful highlight which gives a totally natural look. The highlight I love to use on a daily basis is the Mary Lou Manizer. I have used this religiously for around 2 years now and I am yet to find another highlighter that can beat it. It retails for around £16-17 and you can purchase it online or in store from Debenhams. For blush I have been using another present from my brother that I got for Christmas. This time it’s Rockateur by benefit which retails for £24.50 in Boots and other online and in-store retailers. It’s a perfect shade for my fair complexion and is sooo pigmented so a little goes a long way. Now onto Mascara. For mascara I’ve been using the L’Oreal Mega Volume Miss Baby Roll which retails for around £7.99 in drug stores. I’m not really a sucker for a really good mascara as I always use an eyelash curler so pretty much anything will do the job. That pretty much concludes my everyday makeup routine in a very long winded blog post (sorry!) If there’s anything in particular you’d like me to wrote about or review then make sure you leave a comment down below.